There are many different ways to combine one’s love of skiing and mountains with making a living. For Gary Milliken that means creating trail maps. Once the summer map was complete, he converted it to winter colors and info. With traditional hand painted maps, there is a point very early on in the process where the artist has to start painting and the ability to change on the fly becomes more and more difficult. But the VistaMap process allows receiving input and fine tuning right up to the point of going to print, which came in handy on the Killington project with a quicker need for the summer map, Milliken noted. “A trail map seems like a simple thing, but it accounts for several important functions for the resort – creating an attractive image for marketing and display purposes, modifying for different uses and events, but arguably the most important aspect is that as a resource for guests to successfully navigate the mountain and have easy access to vital safety information. The safety aspect makes it imperative for all of the information to be accurate,” Milliken added. The challenge to creating the Killington maps was “the variety of terrain across multiple, opposing faces. The easy way out is to take a view from a very high, bird’s-eye perspective, but the drawback of this is it visually flattens the terrain. I spend a significant amount of time optimizing a lower perspective view that gives the guest a better visual feel for the terrain,” he explained. Having just produced the new winter map last year, Milliken had to update it for this season due to some major changes like the new skier bridges, Snowdon Six and South Ridge chairs. “This is where the way my maps are built make for easy and seamless changes. 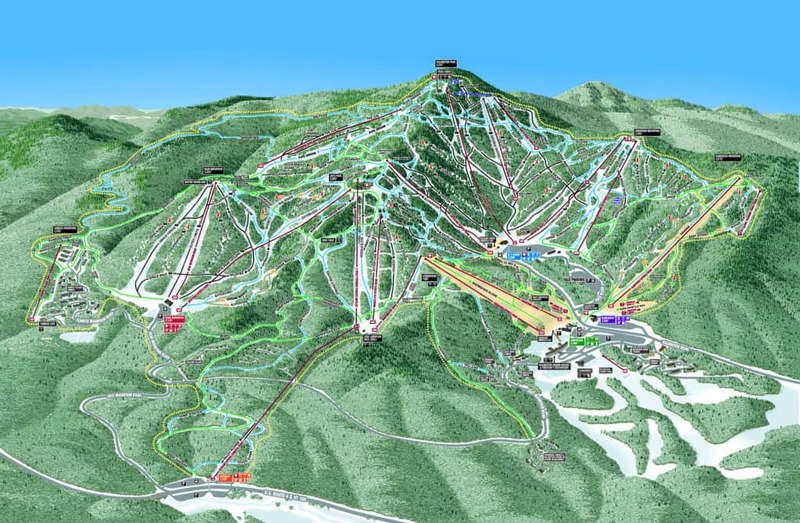 For Killington, I only needed to push a few things around to integrate the changes,” Milliken noted. While loving his job and traveling the world now, Milliken didn’t know he wanted to become a cartographer when he attended college. So when he graduated from the Parsons School of Design in 1985, he became a self-employed house painter for several years. Then one rainy day, curious about what they did, he visited Sitour North America, which is located near his New York home, and walked out with a job. That fortuitous 1989 meeting led to a new career and a vocation that combines his lifelong love of skiing with creative design. At Sitour at the time, map displays were hand painted and when they required updating, Milliken travelled to the resort and handpainted the required changes on each map. “I also produced mountain renderings in pencil that were used as the reference to produce the large displays which were painted in Austria,” he said. He saw the possibility of creating a new form of trail-map illustration after being introduced to Adobe Illustrator in 1993. Milliken left Sitour, bought his first Mac and pioneered the use of digital-based art for creating trail maps using a computer. Along the way, he introduced the ski industry to the process of using large format digital vinyl graphics to reproduce large on-mountain maps. He created maps for Whiteface, Gore and Mt. Van Hoevenburg in 1994 and formed his company VistaMap. Since then, he has created trail maps for 36 ski resorts in the U.S. and another 12 worldwide. He’s also produced some 70 maps of amusement parks, zoos, and other leisure activity resorts. Unlike bitmap images comprised of individual pixel-driven squares which become noticeable when the image is enlarged (i.e., jagged lines, visible squares), objects in a vector-based image are defined by math and are infinitely scalable without losing image quality. “Algorithms are used to define objects so as you enlarge the object (image) the math multiplies to maintain the shape as a smooth line. Not restrained by squares, there is no limit to this scalability; therefore my maps could be printed at any size without loss of quality – every line, edge remains absolutely smooth,” he explained. Milliken further defines objects by adding color and in some cases additional texture – “you’re just adding more information to the digital description of the object, so each object – trees, rocks, buildings, shadows, everything – remains an individual object and the description can be changed at will. Any object can be added, removed, altered in size, location, color, or orientation independently of all the other objects in the rendering,” he said. Thirty years ago skiers checked out a paper trail map to plan their day or find their way. Today they are as likely to use a smartphone, tablet or computer so Milliken continues to enjoy creating the digital versions that help people find their way on mountains from Stowe to Squaw Valley. And whether working for a large or small area, Milliken is proud of producing the accurately scaled maps that assist skiers in finding their way.